The new location has a fresh set of offerings that include new drinks, sandwiches and even breakfast goods. “The number one reason that I’m coming to the Heights is [because] this is where we built our food truck roots,” says Turner. “We were parked at the Little Woodrow’s not far from here. We have done over 1,000 catering events in this neighborhood for people where we pulled up in their driveway for birthdays and parties. This was probably the number one location we wanted [from the beginning], but we had to find the right spot. I love the people in this area.” He adds that the neighborhood demographic is edgier and residents will likely embrace the full bar (named the Teacher’s Lounge), something he’s worked toward for years. The full bar sports two, 50-inch flat screen TVs that Turner hopes will encourage guests to visit and cheer on Houston sports teams. Local veteran bartender Linda Salinas developed the boozy side of the beverage program. A regularly rotating roster of frozen cocktails (current offerings are a Texas Blackberry Bramble and a Grapefruit Paloma, $6.50 each) share space with 12 Texas beer taps, assorted import and domestic brews, and a strong bourbon selection. (Turner’s personal favorites include Weller’s and Basil Hayden.) Family-friendly milkshakes are still available, as are four spiked varieties that sell for $8 each, such as Chocolate + Coconut with rum and Peanut Butter + Jelly, a peanut butter shake with Chambord and banana rum. The breakfast menu, unique to this location, offers both quick bites and heartier dishes. Savory sliders are sold individually at prices that range from $2.75 to $3.75 so diners can mix different ones if they desire. Each one features a frittata-style egg and a Slow Dough challah bun with three variations: the Exchange Student (pepper Jack cheese, spicy guacamole, and pico de gallo), the Junior Varsity (pecan smoked bacon or housemade sausage with cheddar cheese and chipotle aioli), and The Dean (slow roasted beef, swiss cheese, and housemade chimichurri). The 1918 is an “everything bagel” from the NY Bagel Shop that, according to Turner, cradles one of Bernie’s favorite combinations: fried eggs, cheddar cheese, housemade mayo and mustard. The $7.25 sandwich also comes with a choice of either a housemade sausage patty or pecan-smoked bacon. According to Justin Turner of Bernie’s Burger Bus, the bacon-laced Schoolyard Spuds are like “tater tots on steroids.” Photo by Ellie Sharp. Morning side dishes range from light and healthy—such as the Mixed Fresh Berries ($5.50) lightly kissed with honey-lime dressing—to rich and hearty, like the crispy, bacon-studded Schoolyard Spuds ($4.25) that Turner describes as “tater tots on steroids.” Breakfast booze is a no-brainer when the School Nurse ($6.50) is on shift. It’s a bloody Mary with housemade pepper infused vodka, housemade mix, and a chili lime salt rim. 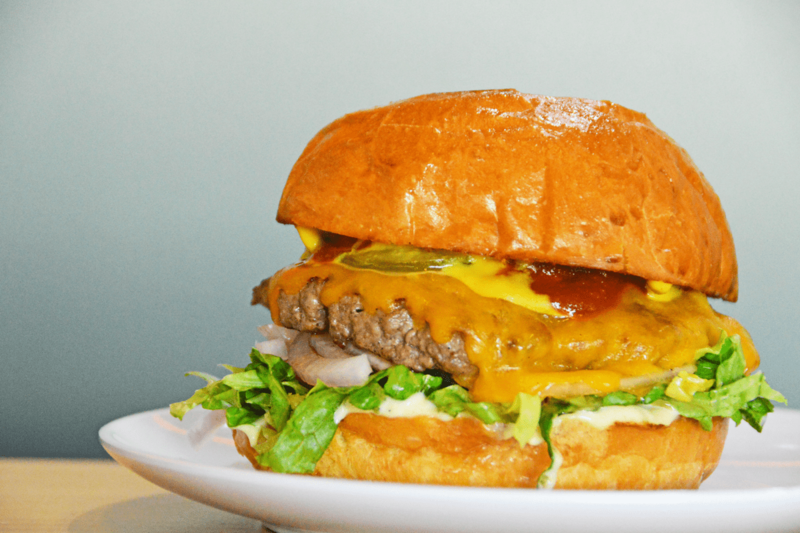 Though burgers are still the restaurant’s primary focus, Turner says he’s excited to finally present some solid chicken sandwiches—a goal of his for several years. (Bernie’s already offers a chicken burger made with chicken thighs ground in-house). Chicken breasts are brined in extra pickle juice (from housemade pickles, of course) for four hours to lock in flavor, salt, and tanginess. That step also ensures they don’t get dry after cooking. 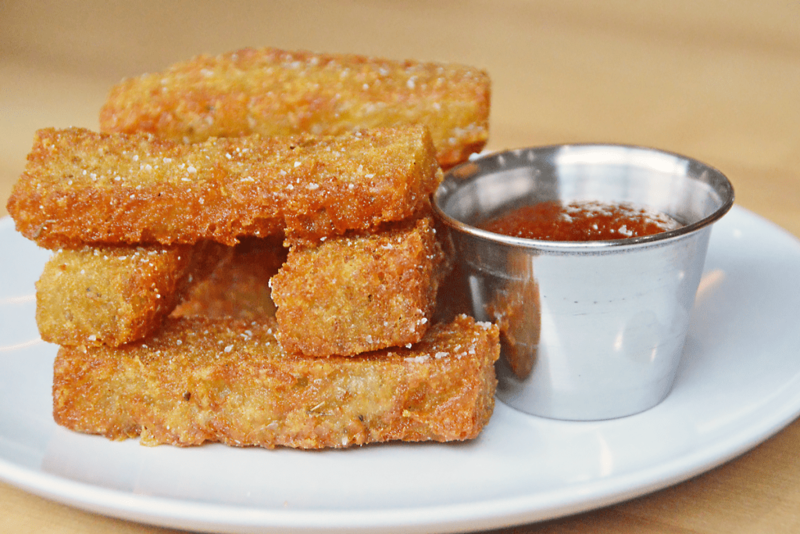 Available grilled or battered and fried, and costing $7 per sandwich, the three topping variations include Classic with Juke sauce, which is a creamy-tangy-spicy blend of extra hot Valentina hot sauce, ancho chili powder, housemade mayo, lime zest, and lime juice. Other choices include the Backyard Bird with housemade pickles, red onions, cheddar cheese and Bernie’s barbecue sauce; and The Club with lettuce, tomato, pecan smoked bacon and jalapeno ranch. Burger lovers should keep their eyes open for the debut of a high-end program named Bernie’s After Dark, which features patties made from 60- to 90-day aged steaks, such as ribeyes and New York strips. Diners can expect the same French fries in all their familiar glory, including the popular Bleu Cheese Fries and Lunch Lady Fries loaded down with slow-cooked beef, local cheese curds, aged white cheddar, housemade brown gravy and green onions. The same orange, green and gray palette used at the other locations (which were designed by Jim Herd of Collaborative Projects, according to the Houston Chronicle) provides continuity to a space that has banquette and table seating spaced throughout. A cozy patio that flanks one side provides ample shade and ceiling fans to combat Houston’s notoriously brutal temperatures. Just as at the other locations, diners can nosh to the tunes of Turner’s personal Pandora list; a steady tempo of the Beastie Boys, local musicians like Bun B and a variety of hip hop artists. 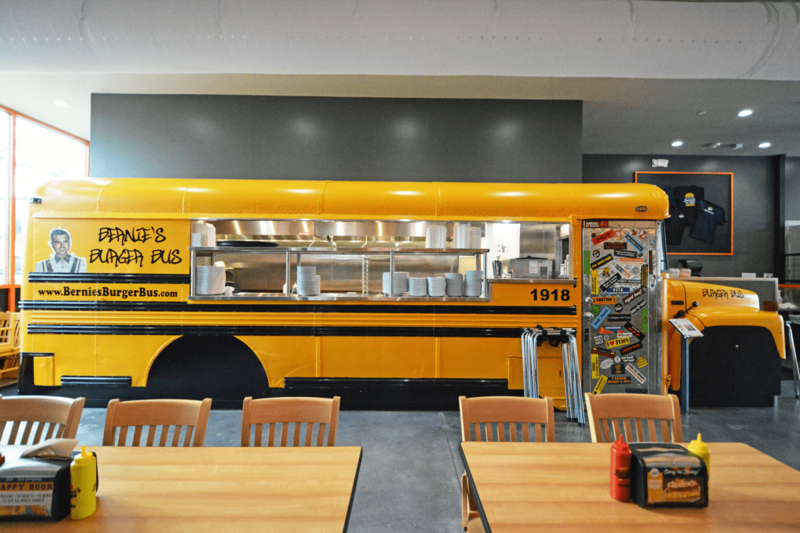 Though the Teachers Lounge (i.e., the bar) is a major highlight, the focal point of the restaurant is undoubtedly the 1986 school bus built into one wall from which every dish is served. A nearby sign identifies it as the original Bernie’s Burger Bus—THE one that launched them all. The bus number is 1918: the year Turner’s grandfather and restaurant namesake Bernie was born. “There are so many great things to do with that bus and it’s awesome now that it gets to keep serving cheeseburgers—but this time it’s not going to run out,” said Turner with a misty-eyed smile and a chuckle. Bernie’s Burger Bus in the Heights opens Monday, July 31 at 7 a.m.
We can’t wait, it’s walkable when the weather cools! 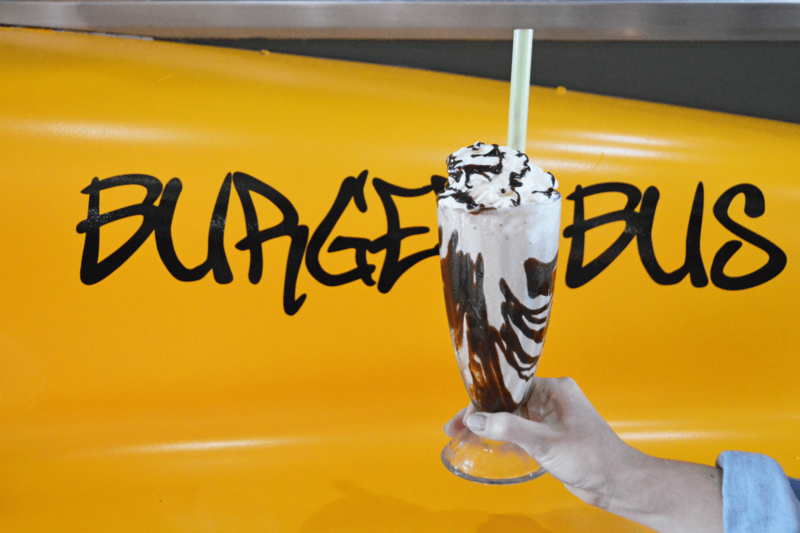 I’d love it if they could get the old Burger Guys recipe for their Guinness milkshake…..